A new ale was added to the Virgin Trains East Coast Foodbar menu towards the end of 2015, it's called "Hop on Board" and has been available since Monday 19th October. It's been a long time since we've had bottled ales on East Coast trains, GNER used to offer a guest ale but they scrapped it around 2003 citing lack of demand (they never did anything to promote it). In more recent times Virgin Trains (West Coast) have introduced their own beers produced in association with Redwillow - Tilting Ale is available for sale in the onboard shop and the Euston First Class lounge and Tilting Bitter is offered in first class. The fact that Virgin Trains were offering a custom ale gave me hope that Virgin Trains East Coast would do the same, I have been trying to convince the various operators of the East Coast franchise over the years that they should work closely with local breweries on the route but until VTEC came along this idea fell on deaf ears. Some other train operators now sell bottled ale, for example Great Western often has a selection of ales from Devon and Cornwall and Grand Central always seems to have at least one bottled ale on board but Virgin Trains was the only one to offer their own custom ale. 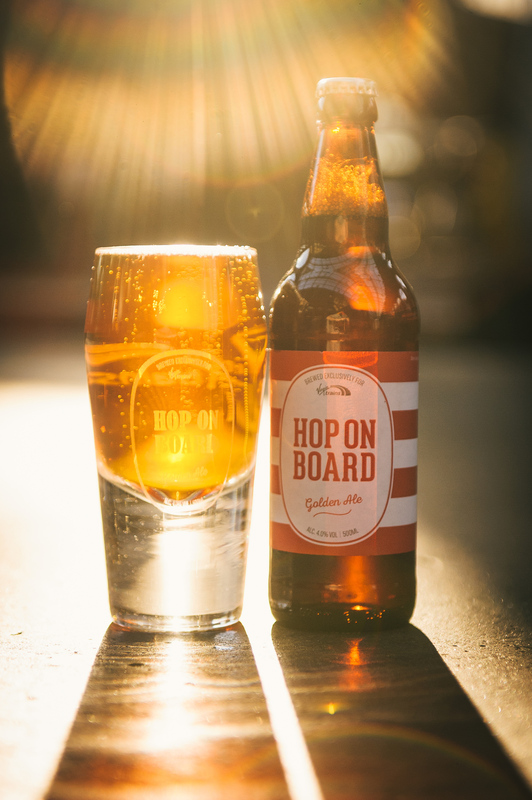 "Hop on Board" is brewed at the York based Rudgate brewery and is a pale ale of 4% volume served in a 500ml bottle when purchased from the Foodbar or standard class trolley or a 330ml bottle when offered complimentary in first class. It has a pleasant taste that should appeal to most ale drinkers, it has no extremes of taste and isn't overly hoppy despite its name. Overall I would say most beer drinkers will enjoy it and as they're only stocking one type of ale it makes sense to have one with a broad appeal. I hope that even those who don't normally drink ale will give it a try. They also have a specially designed glass for it called "The Hoptimist" named because it's supposed to give the appearance that it's half full even when it's empty. Unfortunately these glasses were only produced in a limited number and aren't available for sale or for use in the lounges. I've tried the beer a few times so far and it certainly goes down well. In standard class it goes really well with the bacon roll (which despite the menu saying it's only served until 10:30am has actually been on every evening train I've been on). It has gone well with the first class menu options too. The feedback I've noticed on Twitter has been extremely positive, of course it doesn't suit everyone but the positive tweets substantially outnumber the negative. It's good to know CAMRA (Campaign for Real Ale) are supporting of this venture, they said "We’re seeing thousands of UK consumers turning to premium ales, so Virgin Trains [East Coast] supporting another of our Great British real ale brewers can only be a good thing". This is different to their attitude in 2003 when I was asking for their support when GNER were looking to abolish the bottled guest ales, back then they took a hard line on the real ale definition and didn't support anything that wasn't strictly real ale. Basically CAMRA only considers bottled beers real ales if it's bottle conditioned (i.e. there's yeast sediment at the bottom of the bottle), as most bottled beers (including Hop on Board) don't meet this definition they're not strictly real ales which is the reason they didn't provide any assistance in trying to encourage GNER to keep the guest ales. Originally this was not offered in first class but this was rectified a few months later and the 330ml bottles are now complimentary in first class. On a weekend no alcohol is offered complimentary in first class and it is not possible to order at seat, the only option is to go to the Foodbar. This is something I hope Virgin Trains East Coast rectify, if there's something on the Foodbar menu a First Class customer wants it should be possible to order it at seat (after the staff have finished serving the complimentary offering). The price is £4 a bottle which, living in London, doesn't feel too expensive but it is the most expensive beer on the menu (Stella Artois is £3.50). I think if they ran a promotion on it for a short period where it was the cheapest beer on the menu (let's say £3) then I think it would encourage people who aren't generally ale drinkers to give it a shot and they may find they like it. Tip: you can save money by buying catering vouchers for Virgin Trains East Coast. They're offered for sale if you're booking online direct or you can get them from Virgin Trains East Coast operated ticket offices. A £5 voucher costs £4 making it a 10% discount. Buy 4 vouchers (£16) and you effectively get 5 bottles for the price of 4. The First Class lounge in King's Cross is able to sell 550ml bottles of Hop On Board and they also sell a gift pack of Hop on Board which consists of 4x550ml bottles for £12. This also means you could buy some to take on the train so you don't need to go to the Foodbar later which would be useful on weekends when alcohol is not part of the first class offering. Originally most trains carried eight bottles. As the mk 4 sets have a total of 535 seats they're expecting less than 2% of a fully loaded train to buy a bottle. The numbers have been tweaked over time and varying on different routes and some now have more bottles loaded. If you do find yourself on a train that's run out make sure that you ask the person serving you if they can restock enroute (usually possible) and also mention the stock shortage to @Virgin_TrainsEC via Twitter. Let's hope this is the start of more collaborations with producers along the route, make the onboard experience truly unique by offering something that you can't just buy in a supermarket before you travel. I think the aim is to make Hop on Board a permanent addition to the menu, if it's successful I'd like to see a guest ale added to the menu which would be produced by a different regional brewery each month giving a choice of two ales for the customer. As mentioned earlier I think promotions would encourage people to try the beer, one option would be to make the price lower than the other beers for a set period, another option is multibuy deals (although with both of these they'll need to increase the number on-board) it might also be worth using the Virgin Red app to push Foodbar offers to passengers. I hope the partnership with Virgin Trains East Coast helps raise the profile of the Rudgate brewery. The brand awareness will make me more likely to want to try their other beers if I see them in a pub or shop. It would be good to see this offered in the station bars along the route (but restricted to the route only to maintain some exclusivity). Even if it was just done for a month and then going back to on-board only it would help raise awareness of the beer.